No two students learn the same way. No two teachers teach alike. Marshall Craft Associates’ accomplished academic studio creates learning communities that accommodate a wide range of teaching and learning styles in a safe, welcoming, engaging and sustainable environment. We find great design bears fruit, and results in positive learning outcomes for all students, the satisfaction for your professional staff, and supportive parents and community. From nurturing pre-kindergarten infants to high school seniors, and students with special challenges, MCA-designed school facilities contribute in profound ways to a lifetime of success in learning. 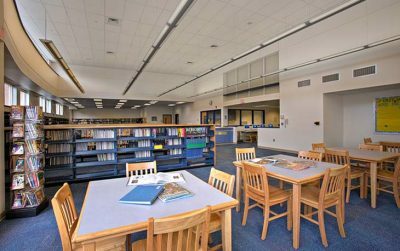 MCA’s expertise in school design spans a broad range of owner, user and project types. Our familiarity with the evolving needs of Pre-Kindergarten through 12th grade facilities includes years of experience working with Public, Independent and Charter schools. Of special note, we have a significant experience in helping schools with populations of learning different and otherwise challenged students in the areas of Behavioral Health and Special Needs, including Childcare environments. We bring knowledge of specialized design criteria for these facilities to each project, and confirm the right solution through in-depth user input and attention to the smallest details. Independent schools in the Mid-Atlantic region are more densely concentrated than in other parts of the country. This is particularly true in Baltimore, where MCA is headquartered. Academically, these schools have smaller class sizes and lower teacher / student ratios than their public school counterparts. 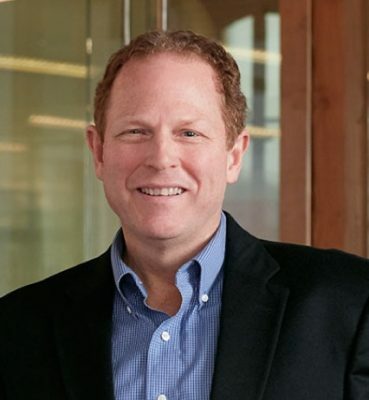 As with all education institutions, however, teaching models are shifting, requiring modifications to academic buildings and support facilities. Among other trends, many schools are looking to incorporate program elements such as childcare, flexible classrooms, specialized athletic facilities and maker spaces to enhance learning opportunities for students. Other independent school considerations that affect physical space are expanding student populations, safety & security, integration of technology, and alumni involvement. MCA’s mission is to integrate these factors with the unique culture, history, and traditions of each independent school campus. MCA enjoys a strong reputation with Public School Boards and their educational, administrative and facilities staff for developing highly successful public school facilities, through services ranging from master planning, programming and educational specification authorship to new construction, renovations, additions and systemic renovations. We have also completed existing school facilities assessments, including being on the team that evaluated every public school building in the State of Wyoming. MCA senior staff have presented multiple times at ASBO Conferences, developed school prototype designs, authored state school building construction standards, developed school system standard technical specifications, sat on a Superintendent’s Advisory Committee for over 15 years and volunteered in public schools through the Construction Industry Educational Foundation. MCA has a longstanding relationship with one of the nation’s leading behavioral healthcare systems. They are the largest provider of non-public, special education programming in Maryland, serving students with special needs, the majority of whom have been diagnosed with autism. MCA has developed special education residential and day program school facilities on multiple campuses for students affected by a range of social and behavioral challenges. These facilities and programs serve age ranges from 2 years through young adults of 21 years. 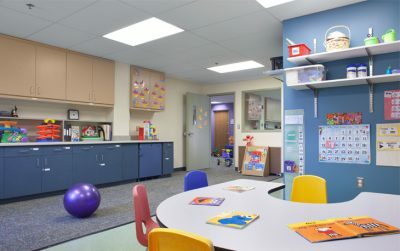 In addition to unique curriculum and space requirements, special attention must be paid to all levels of architectural detailing in these facilities to ensure a safe yet nurturing environment for students and staff. 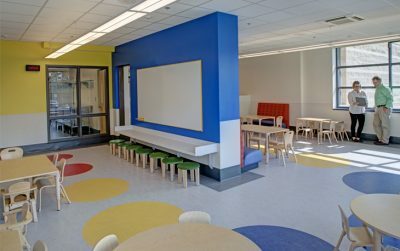 MCA has highly specialized experience designing school facilities focused on providing support for students with a wide variety of special needs. These schools must provide a safe, welcoming and educationally effective environment, but often need to accommodate a wider range of considerations and accommodations than a typical school. Our designers are aware of, and sensitive to, the specialized detailing required to respond to the unique challenges that may be faced by these students and their teaching and support staff. 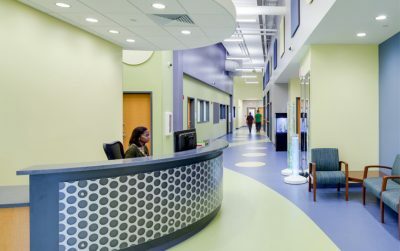 These can be wide ranging and include considerations for flooring color contrast, special lighting, acoustical mitigation, accommodation of specialized mobility equipment for bathing and many other needs. 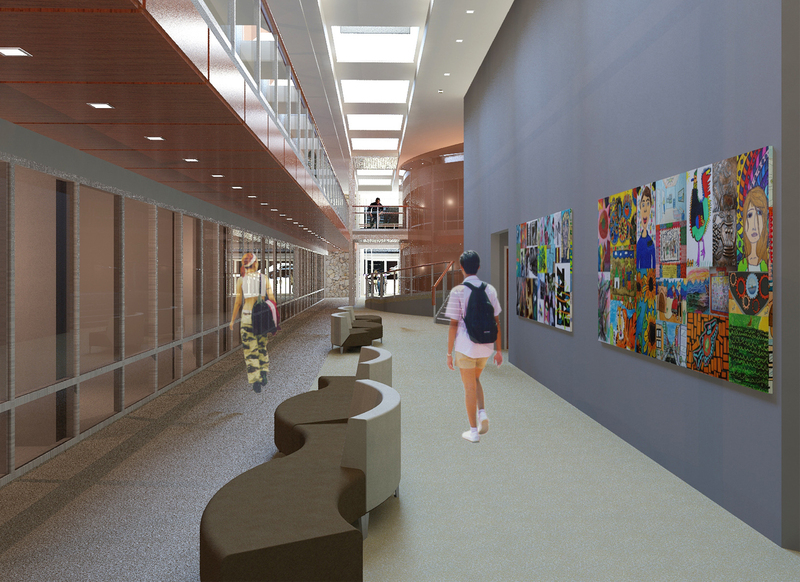 Some of these facilities are residential and cover a range of student population ages, from infancy to young adulthood, in one facility or campus, requiring a variety of building design solutions to meet the full range of student educational, physical and social needs. Facilities providing care and education for infants to children of four years of age have their own special requirements, from State licensing regulations to child-specific safety considerations. MCA enjoys the interaction with staff in crafting nurturing environments that can positively impact student social and educational growth during their crucial early formative years. In addition, our designs respond to the unique needs of small children in a group environment. This includes respecting the scale at which they operate and reflecting this sensitivity in the detailing of childcare environment, while still allowing acclimation to some of the challenges they may encounter in their home environment and in the world at large. MCA has teamed with Facilities Engineering Associates (FEA) on the assessment of millions of square feet of public school buildings, both at the K-12 and University level. For example, FEA has conducted assessments of all the public schools in the State of Wyoming, and all the public schools for Montgomery County, the largest school system in Maryland comprising over 215 facilities. MCA provided support for development of technical assessment criteria as well as field assessors for these efforts. FEA has developed a proprietary methodology for school assessments, which can be customized depending on system needs. Fund-raising is a useful, and often necessary, tool to finance a new building or major renovation. This is particularly true for independent schools. While some have healthy endowments, others rely more heavily on their capital campaigns. MCA can assist with fund-raising efforts by providing renderings, feasibility studies, cost analysis, board presentations, and a variety of other resources. Our goal is to help you realize your vision. Ready To Work On Your Next Pre-K - 12 Education Project? St. Paul’s School for Girls Learning Commons renovation has reached completion. MCA is pleased to announce the completion of St. Paul’s School for Girls’ newly renovated Learning Commons. The Early Learning Center earns the Excellence in Construction Award from ABC Baltimore.